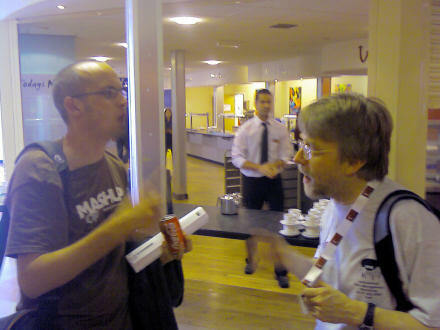 Paul Boag and Brian Kelly chatting at IWMW2007. We arrived safely in York on Sunday evening, though (unlike Scotland) it was disappointingly wet and cold. Our rooms have no WiFi access so, like other parts of this ancient city, it feels in many ways like being transported back to Roman times. But with more electricity. And indoor sanitation. The first talk was by Dr Steven Warburon, from the School of Law at King’s College London who talked, amongst other things, about digital identities, and how much of what is done online these days is about curating your own online identity. He is part of the Emerge project. Innovation often happens at the boundaries of communities where interaction exists. Next up was Alison Wildish, Head of Web Services at Edge Hill University who gave a fabulous presentation entitled “Let the students do the talking…”. University web services are often somewhat behind the cutting edge online technologies offered by the likes of Google, Yahoo! and Microsoft, for example. And since many young people come to university already with their own blogs, social networking, email and instant messenger accounts they don’t take up the services that are offered by the universities. After all, who wants to manage so many duplicate accounts? So Alison’s point was that we should instead go out to where the students already are and deliver our information to the platforms and applications that they already use, such as Facebook, MySpace, Bebo, etc. They don’t come to us — so we’ll integrate with them. Sounds like a good gospel message that; something for the Church to bear in mind. Stuart Smith ran a very good workshop introducting people on the web and portable devices, highlighting important differences between serving up “device agnostic” or “device specific” applications or pages. I was encouraged to see that I have more of an understanding of the issues involved in writing for portable devices than I had given myself credit for — it’s all those years playing around with Psions and mobile phones I guess. So for that reason alone I would have liked him to have gone into much more depth than he was able to with such a whistlestop introduction. One of the other highlights so far is simply meeting people and chatting. There are quite a few of the Scottish Web Folk group here, so it’s been great to catch up with them. Shortly after registration Brian Kelly, who’s chairing the conference this year, came up to me and said “You have a blog!” And he was right: I do! But I knew that already. I think his point was that he recognised me from it. See … blogs are good things! I also met up with Paul Boag who produces an excellent weekly podcast on all matters related to running, coding and managing websites. It’s available as a download from his website or you can subscribe to it via iTunes. Tomorrow we have a full day of talks on such topics as information architecture (by Keith Doyle from the University of Salford), building highly scalable web applications (by Jeff Barr of Amazon), and social participation in student recruitment (by Paul Boag). Then in the evening we have a drinks reception at the National Rail Museum. But for now, I’m off to bed and I’ll post this in the morning once I get into WiFi range!